In a few short days, some of the city’s top designers will be transforming the interiors of Nashville’s newest signature home event, the Nashville Symphony Show House, with beautiful, inspiring designs in each room of the over 5,000 square foot custom build which opens for tour daily June 12-28. This project has so many layers resulting in a stunning Southern Contemporary Folk style home located in the Forest Hills area of Nashville. The Castle Homes’ team has earned a reputation as meticulous builders from planning and budget to use of the top craftsmen, artisans, subcontractors and materials. Here’s a little of the behind the scenes magic of this house slated to be the top home event of the year and benefiting the Nashville Symphony. Weaving historically inspired architecture with low-maintenance materials is an important element to the Castle team. Company president Alan Looney and several members of his team attended the 2015 International Builders’ Show where he found an Azek non-rot material to use as a historic sill or bridge between siding and brick which would have been standard in the 1800s. This small attention-to-detail adds a lot to the overall character of the home. The front columns of the home are designed to mimic old-growth timber. Castle uses a non-rot fiberglass product. And, brick pavers on the front and rear porch have a great weather-worn look and are kiln-produced by Kasten. 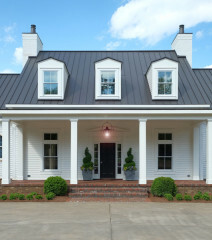 A standing seam metal roof is an important element of a farmhouse or folk style home. (Folk is indicative of a farmhouse when located on a non-working farm.) The Nashville Symphony Show House has a metal roof with a baked-on finish, which won’t have to be repainted, and has a 50+ year life span. On a rainy day, you’ll have a lovely, melodic sound. Castle Homes adds the extra touch of additional insulation to soften the volume. We’ll step inside next to reveal the sculptural staircase and the kitchen island made from a 300-year-old milk barn in Wisconsin. Be sure you don’t miss the Nashville Symphony Show House tour open daily from 11 a.m. until 6 p.m. from June 12-28. Click here for tickets.